Several Wall Street analysts have maintained their “Outperform” or “Buy” ratings on Facebook. Analysts are confident the company could move past the Cambridge Analytica scandal, and that it will have minimal impact on marketers and users. Check out Facebook’s stock price in real time here. Much of Wall Street has doubled down on its bullish stance with Facebook. 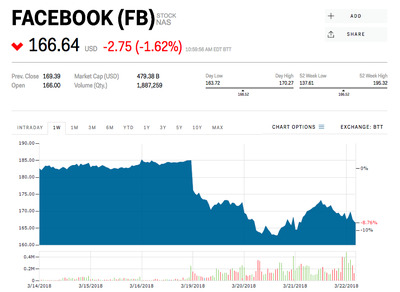 The Street believes the selloff that occurred in the wake of the Cambridge Analytica scandal, which wiped away $US50 billion from Facebook’s market cap, represents a good opportunity to buy the shares on sale. These analysts believe that concerns over the company’s new privacy rules and their impact on advertising dollars are overblown and that Facebook has the ability move past the scandal without losing much of its shine with marketers and users. Though he sees the next two quarters as being weaker for the social media company from a user and engagement perspective, Mahaney likened the negative consumer sentiment to what Netflix experienced after it raised its prices. Netflix drew some ire from customers and subscriber growth suffered as shares fell in the two quarters after the announcement, but that created an “attractive entry point” for investors. “Although conditions are different, this will also prove to be an attractive entry point for FB shares, assuming Facebook’s PR performance improves,” Mahaney said. Mahaney reiterated his “Outperform” rating and set a price target of $US250. But Mahaney was not the only one on Wall Street to maintain a bullish stance. On Thursday, Piper Jaffray’s San Kemp also said it’s a good time to buy Facebook. He maintained his “Overweight” rating and price target of $US210. “We would take advantage of FB’s selloff (off 8% since Mar-16) as we believe the long-term relevance of the extraction is minimal and the near-term catalyst chain is more likely to be positive,” Kemp wrote in a note to clients. 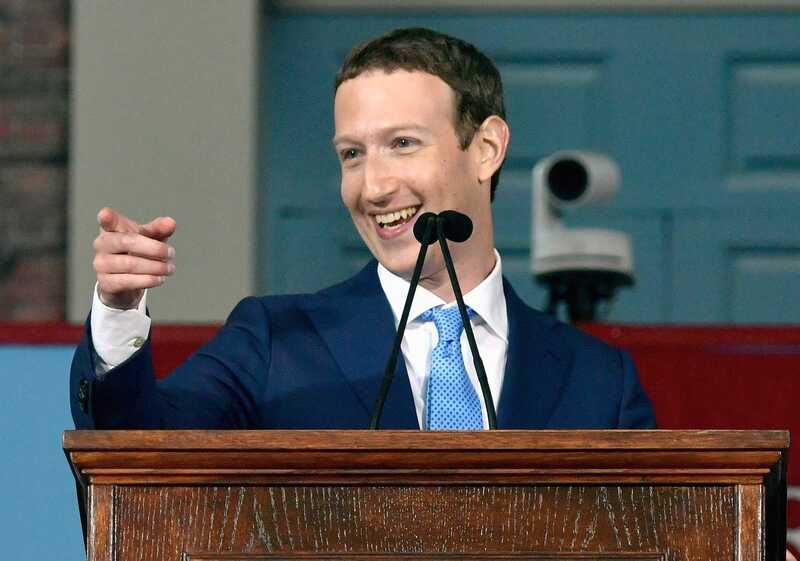 Elsewhere, Benjamin Schachter of Macquarie said he was confident that Facebook would come out on top, especially after CEO Mark Zuckerberg outlined how the company will address the issue moving forward. He retained his “Outperform” stance, and $US200 price target. Meanwhile, Credit Suisse analysts Stephen Ju and Phillip Wang said the risks imposed by the Cambridge Analytica fallout were already priced into Facebook’s stock given that without this data breach, Facebook would have faced revenue growth pressures and a struggle improving consumer engagement. The analysts reiterated their “Buy” rating and maintained their $US240 price target. Moreover, a Jefferies analyst said the Cambridge Analytica debacle would have a short-term impact.He also suggested the social media platform faces the long-term pressure of more government regulation, particularly after new rules in the European Union take effect later this Spring. “We see headlines from data breaches & Zuckerberg’s announced changes to the timeline as near term headwinds to investor sentiment, but do not believe it will have a material impact on top line growth,” Brent Thill, a Jefferies analyst said in a client note. He said Facebook has already begun the process of addressing its privacy issues, and therefore there are no fundamental changes it needs to make. Thill maintained his “Buy” rating and $US230 price target. 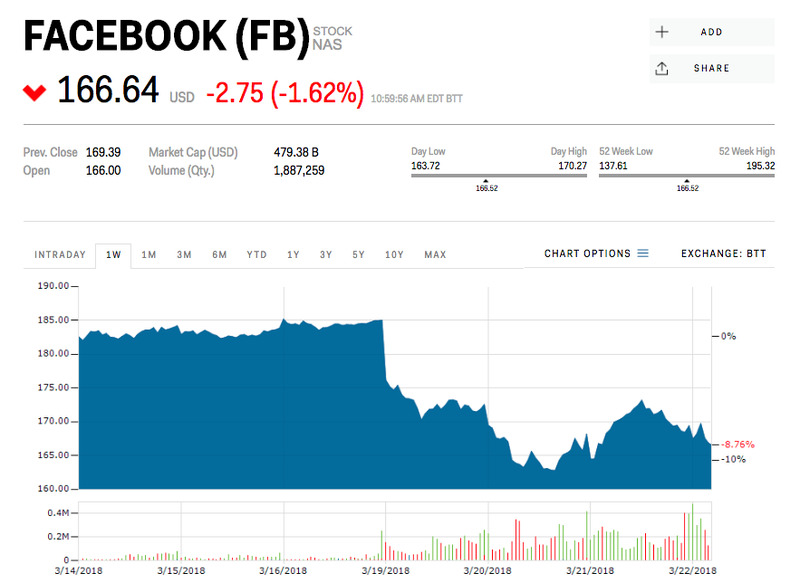 Facebook is down 1.62% Thursday and 8.17% for the year. Read more about how Apple has a ‘competitive advantage’ over Facebook and Google when it comes to privacy.